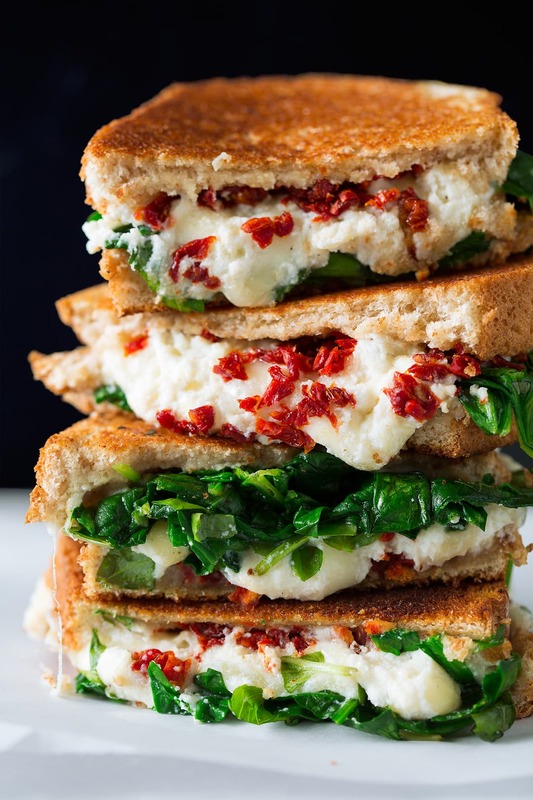 Who could resist this fresh and flavorful twist on grilled cheese? 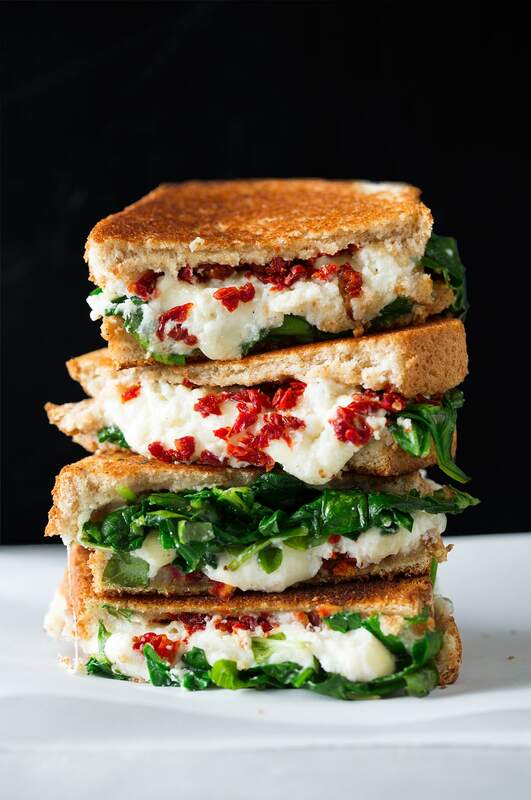 This Sun Dried Tomato Spinach and Ricotta Grilled Cheese is a must try grilled cheese sandwich! 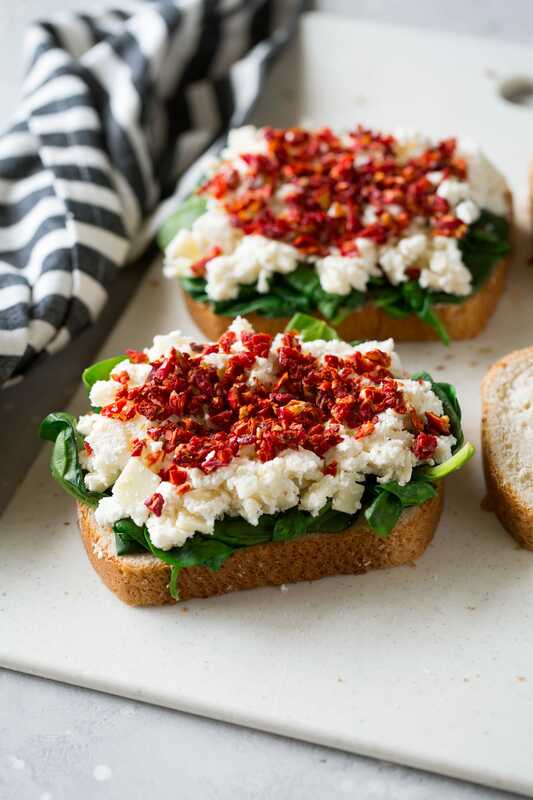 It’s loaded with three kinds of cheese and it has that delicious flavor combo of sun dried tomatoes and spinach. April is National Grilled Cheese Month! 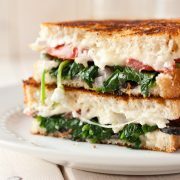 What better way to celebrate than this hearty grilled cheese? It’s perfect for lunch or dinner. It really just makes that plain old cheddar grilled cheese sandwich seem ultra boring! 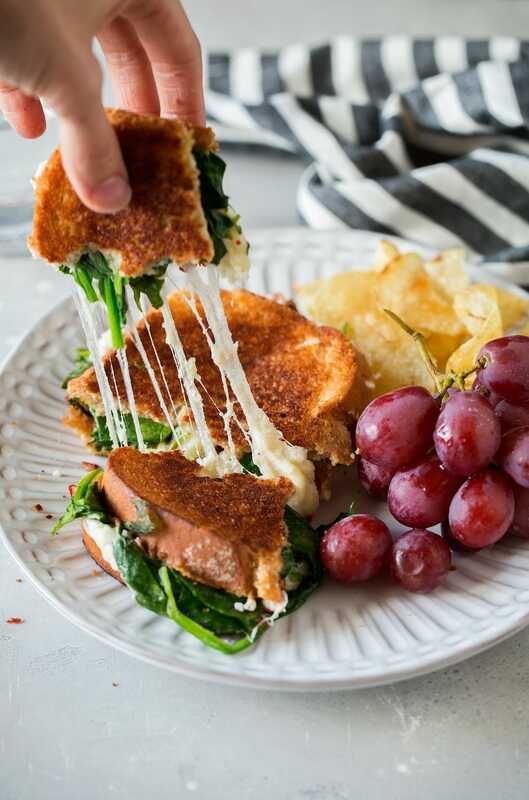 This is a grilled cheese I’ll want to make time and time again! I’ve already made it twice and can’t stop thinking about it. Back to basics. To make grilled cheese I like to lightly butter both sides of the bread, and always use a sturdy bread. Then add in your favorite cheeses and cook in a non-stick skillet over medium – to medium-low heat (here I go with medium-low so that cheese filling will have enough time to melt). Cook just until the bottom is golden brown then flip and continue to cook until golden brown on bottom. Here I also cover it with a lid while it’s cooking to trap in the heat, again to help all that cheese melt. 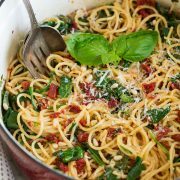 For this recipe you can also sauté the spinach. To do so, rinse and drain but leave the water that clings to the leaves. Then add about 1 Tbsp olive oil to a skillet and sauté the spinach until it just wilts (covering with a lid will make it go faster). Dab dry with paper towels. Then feel free to use oil packed tomatoes or those in the pouch. I opt for those in the pouch for less fat/calories but either works great here. 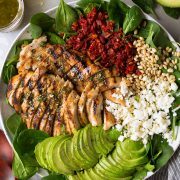 This is such an easy to make, flavorful lunch or dinner! 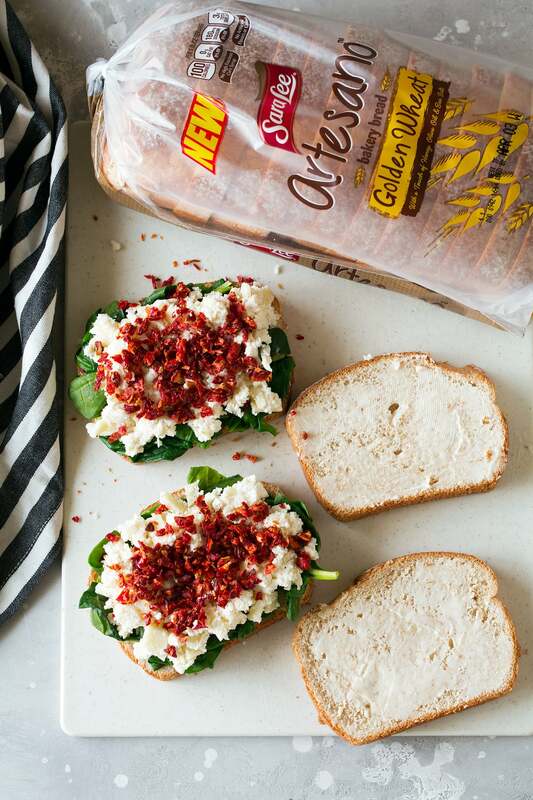 It's made with three kinds of cheese, fresh spinach and those zesty sun dried tomatoes. This is one of those recipes you'll want to make again and again! In a bowl stir together provolone, ricotta, parmesan and garlic. Season with salt and pepper to taste, set aside. In a medium pot bring 1/2-inch water to a boil then place a steamer basket in pot. Add in spinach, cover with lid and let steam until just wilted, about 1 - 2 minutes. Transfer spinach to paper towels and fold paper towels over spinach to remove excess moisture. Butter both sides of bread slices with 1 tsp butter. On two slices of bread evenly layer spinach and basil. Then layer over ricotta mixture and sprinkle and lightly press sun dried tomatoes into ricotta mixture. Heat a large non-stick skillet over medium-low heat. Add sandwiches, cover and cook until golden brown on bottom, about 4 - 6 minutes. Flip and continue to cook until golden brown on bottom and cheese has melted through, about 2 minutes longer (reduce burner temp slightly as needed to prevent bread from browning too much). *If using sun dried tomatoes in oil dab off all excess oil with paper towels.